Touristplacesinindia offers complete information on the village of Nalanda, Nalanda Tourism, Nalanda Travel, Hotels in Nalanda, Nalanda Tour, Nalanda Tour Packages, Monuments in Nalanda, Nalanda Monuments, Holiday in Nalanda, Heritage tour to Nalanda. Located in the state of Bihar in the eastern region of India, Nalanda is famous as the location of the oldest university of the world. During its heydays, it was known as one of the most important seats of learning in the world. The university was also an important center of Buddhist studies, and used to attract a large number of students from far off places like China, Sri Lanka, Indonesia, and other countries where Buddhism had made an impact. At present only a small section of the once sprawling complex lies in ruins near Bada Gaon, a small village about 55 miles south east of Patna. It is an important part of Tourism in Bihar, as several tourists, especially from the countries where Buddhism has thrived, visit this spot. There is some doubt regarding the exact period of establishment of the University of Nalanda. Some scholars believe that it was established in the 5th century AD by the Gupta kings, while there are some references that point to a much earlier existence. There is, however, no doubt regarding the fact that the university flourished between the 5th and 8th centuries. It is said that the residential university catered to 2000 teachers and over 10000 students, many of whom came from far off countries, making Nalanda one of the earliest international universities. Hiuen Tsang, the famous Chinese traveler and scholar arrived here in the 7th century during the reign of the great Indian king Harshavardhana. He is said to have studied extensively about Buddhism and other religions of India, eventually carrying important manuscripts back with him to China. It is quite evident that Nalanda has played a significant role in the propagation of Buddhism in many of the countries where it is popularly practiced today. The glorious journey of Nalanda came to a violent and tragic end when the entire complex was destroyed beyond redemption by the invading Turkish armies in 1197 under Mohammad Bakhtiar Khilji, a general of Qutb-ud-din Aibak, the first ruler of the so called slave dynasty in India. Nalanda never regained its past status, and its fall resulted in a dramatic decline for Buddhism in India. The legacy, however, still lives in far off countries like China and Sri Lanka, where Buddhism is still practiced according to the guidelines formulated in Nalanda several centuries ago. The tours of Nalanda take tourists to the ruins that are the only remaining evidence of the past glory of this ancient residential university. These ruins are among the most renowned tourist attractions in Bihar, and are important to the Buddhist tourists from China, Korea, and other countries along with the other major Buddhist sites in Bihar and Uttar Pradesh like Budh Gaya, Sarnath and Kushinagar. A glimpse of the ruins takes one back to the ancient times when this complex used to bustle with activity. The halls would be filled by students and the ceremonial chanting of monks would be heard from the temples. The desolate ruins would also make one empathize with the tragic end that this glorious institution had to face. 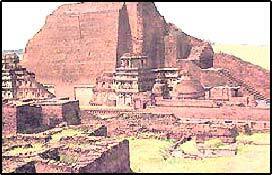 The Museum � among the important places in Nalanda, the Nalanda museum is the most notable. The museum houses relics from the last days of the university. Some beautiful bronze figures of Buddha are also exhibited here, apart from a fine collection of coins and pottery. The Nava Nalanda Mahavihar is also established at this site, and is devoted to the studies of Buddhism and Pali literature. There are some other tourist spots around Nalanda, including Surajpur and Rajgir, which should be covered by tourists during their tours of Nalanda. Touristplacesinindia.com offers all inclusive online information about Nalanda in Bihar, and other important tourist places in India.